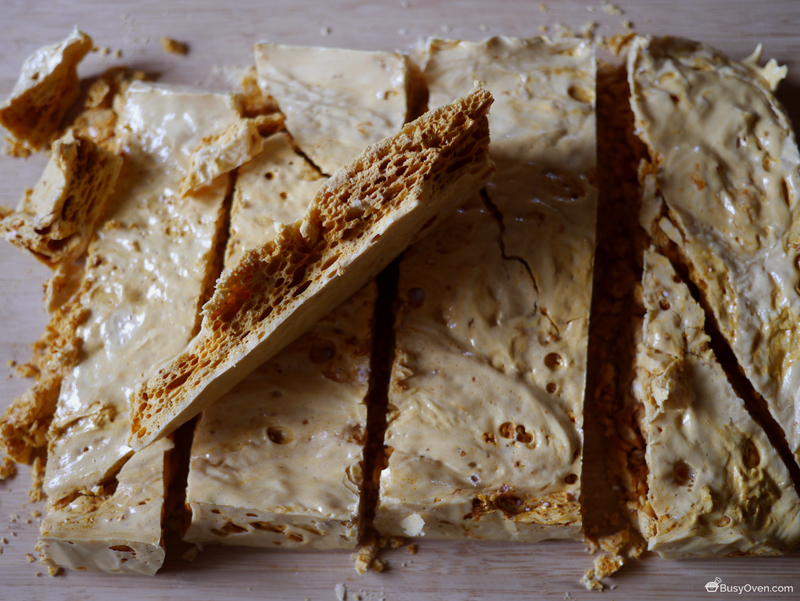 Honeycomb Candy, Cindertoffee, Sponge Toffee. There are several different names for this sweet treat! The first time I had Honeycomb Candy was only a few years ago when a colleague brought back some Crunchie candy bars from the UK back to the office. I thought they were made out of real honeycombs…I didn’t realize how wrong I was! Honeycomb Candy is really simple to make! It only requires 3 ingredients and a candy thermometer. Admittedly, the very first batch I made was tossed out because I didn’t use my thermometer. I ended up overcooking (also read as “burnt”) my sugar. The second batch I made turned out a lot better! It didn’t taste like a torched marshmallow! Making the Honeycomb Candy is actually a delicious science experiment! Watching the chemical reaction between the baking soda and the hot syrup is a lot of fun! It’s a good idea to use a deep saucepan when making this because the hot mixture rises quite a bit after the baking soda is added. Another note to make is that this is probably better to make in dry weather. The Honeycomb Candy tends to get sticky with humidity. After breaking my Honeycomb Candy brick into small pieces, I saved the crumbs to put on some vanilla ice cream. I couldn’t let that sugary goodness go to waste! This is also delicious dipped or coated with dark chocolate! I’m sure they’d also be great on cakes and cupcakes! Prepare a 9″x13″ pan by lining with aluminum foil and greasing the shiny side with butter or cooking spray, and set the pan aside. Combine the corn syrup and granulated sugar in a medium saucepan. Mix the sugar into the syrup, but avoid getting sugar granules on the side of the saucepan (brush sugar granules away with a damp pastry brush). On medium to medium-high heat, cook the sugar/corn syrup without mixing it until it reaches 300 degrees F (149 degrees C). Note: it’s okay to swirl the pan around, but don’t mix the sugar with a spoon or spatula. Remove the saucepan from the heat and whisk in the baking soda. The syrup mixture will react to the baking soda, so be prepared for the mixture to rise and foam up. Be very careful! The sugar mixture will be extremely hot! Quickly pour the Honeycomb Candy mixture into the prepared pan. Do not try to even out or smooth the mixture in the pan after it is poured. Let it cool down to room temperature (appx. 30 minutes). Remove the Honeycomb Candy from the pan and carefully peel the aluminum foil away. Either break the Honeycomb Candy with your hands or cut it with a serrated knife. Store in an airtight container.